John Erskine, Earl of Mar, KT (1675 – May 1732) was a Scottish Jacobite who was the eldest son of Charles, Earl of Mar (who died in 1689), from whom he inherited estates that were heavily loaded with debt. He was the 23rd Earl of Mar in the first creation of the earldom. He was also the sixth earl in the seventh creation (of 1565).. He was nicknamed "Bobbing John", for his tendency to shift back and forth from faction to faction, whether from Tory to Whig or Hanoverian to Jacobite. Deprived of office by the new king in 1714, Mar raised the standard of rebellion against the Hanoverians; at the battle of Sheriffmuir in November 1715, Mar's forces outnumbered those of his opponent, but victory eluded him. At Fetteresso his cause was lost, and Mar fled to France, where he would spend the remainder of his life. The parliament passed a Writ of Attainder for treason against Mar in 1716 as punishment for his disloyalty, which was not lifted until 1824. He died in 1732. Portrait of John Erskine as a boy painted in 1690. 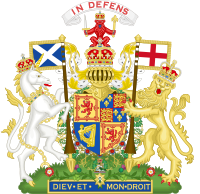 In the early 18th century Mar was associated with a party favourable to the government, was one of the Commissioners for the Union, and was made a Scottish Secretary of State; becoming, after the Union of 1707, a representative peer for Scotland, Keeper of the Signet, and a Privy Counsellor. In 1713 Mar was made by the Tories a British Secretary of State, but he seems to have been equally ready to side with the Whigs, and in 1714 he assured the new King, George I, of his loyalty. However, like other Tories, he was deprived of his office, and in August 1715 he went in disguise to Scotland and placed himself at the head of the Jacobite adherents of James Edward, the Old Pretender. Meeting many Highland chieftains at Aboyne, Mar avowed an earnest desire for the independence of Scotland. At Braemar on 6 September 1715, he proclaimed James VIII King of Scotland, England, France and Ireland, thus beginning the Jacobite rising of 1715. Gradually the forces under his command were augmented, but as a general he was a failure. Precious time was wasted at Perth, a feigned attack on Stirling was without result, and he could give little assistance to the English Jacobites. At Sheriffmuir, where a battle was fought in November 1715, Mar's forces largely outnumbered those of his opponent, the Duke of Argyll. The battle was actually a draw (each army's right wing defeated the other's left wing). However, Mar's indecisiveness meant that the aftermath of the battle was strategically a decisive defeat for the Jacobites. Mar then met the Pretender at Fetteresso; his cause however was lost, and Mar and the Prince fled to France, where he would spend the remainder of his life. The Parliament of Great Britain passed a Writ of Attainder for treason against Mar in 1716 as punishment for his disloyalty; this was not lifted until 1824. Mar sought to interest foreign powers in the cause of the Stuarts; but in the course of time he became thoroughly distrusted by the Jacobites. In 1721 he accepted a pension of £3500 a year from George I, and in the following year his name was freely mentioned in connection with the trial of Bishop Atterbury, who, it was asserted, had been betrayed by Mar. This charge may perhaps be summarised as not proven. At the best his conduct was highly imprudent, and so in 1724 the Pretender finally broke with Mar. His later years were spent in Paris and at Aix-la-Chapelle, where he died in 1732. Portrait of John Erskine, 6th Earl of Mar, painted by Hyacinthe Rigaud. Mar first married Lady Margaret Hay on 6 April 1703, daughter of Thomas Hay, 7th Earl of Kinnoull. She bore him a son, Thomas, in 1705. Lady Margaret died four years later on 26 April 1707. Mar married for his second wife Lady Frances Pierrepont, daughter of Evelyn Pierrepont, 1st Duke of Kingston-upon-Hull. The match was excellent, as it provided Mar with the funds to finally begin to clear his inherited debts. Lady Frances went mad in 1728 due to the stress of his exile in France. She outlived Mar by 35 years, dying on 4 March 1767. Through his marriage to Lady Frances Pierrepont, Mar was a brother-in-law of Lady Mary Wortley Montagu. Mar's brother James Erskine, Lord Grange was a noted judge. Mar's son Thomas Erskine, Lord Erskine served as Grand Master of the Grand Lodge of Scotland (1749–1750). He was mentioned in a contemporary folk song "Cam Ye O'er Frae France", which was recorded by British folk rock band Steeleye Span. He was mentioned in the Starz original series, Outlander season two, episode two. The Alloa branch of Wetherspoons is named 'The Bobbing John'. ^ a b c d e One or more of the preceding sentences incorporates text from a publication now in the public domain: Chisholm, Hugh, ed. (1911). "Mar, John Erskine, 6th or 11th Earl of" . Encyclopædia Britannica. 17 (11th ed.). Cambridge University Press. pp. 666–667. ^ "Genesis – Eleventh Earl Of Mar Lyrics". SongMeanings. Retrieved 22 December 2018. "Archival material relating to John Erskine, Earl of Mar". UK National Archives. This page was last edited on 8 March 2019, at 17:43 (UTC).